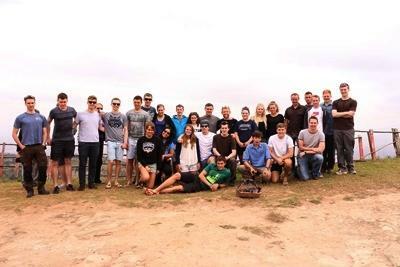 Our group were largely based at Loughborough University, but others in the group were also from the University of Southampton, University of Birmingham, Aston University, Newcastle University and Northumbria University. This is because we are made up of different squadrons from the Defence Technical Undergraduate Scheme (DTUS), I was part of Typhoon and others were from Trojan, Thunderer and Taurus. We had to plan our trip meticulously with Projects Abroad who were helpful in tailoring the two-week programme to meet our needs, because we had to bring the proposition of our trip to Kenya to the MOD in order to get funding. We sought to make a real difference with the Nakuru tying this into our military team building activities and meeting several objectives. We successfully gained funding from the MOD and as part of the agreement we raised further money for local causes. We managed to get to over £12,000 and this continues to increase as we fundraise since we’ve been back to get to our target of £15,000. Before we went away to Kenya we had a meet up meal to get to know each other because a lot of people did not know each other, coming from different squadrons across the country. After reaching Nakuru having settled in we had an afternoon of sports playing football and volleyball with the locals which was great fun. It was also good opportunity to integrate with the local community before we began our building work. 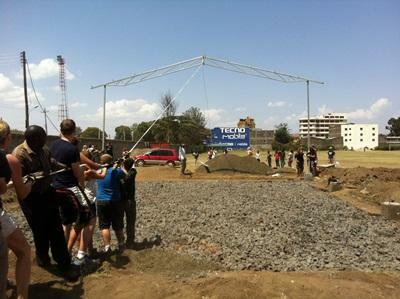 Our task during the trip was the building of a sheltered area to be used by Nakuru Sitting Volleyball Team. When they are not using it the facility is also to be used by the community for various classes and training events. 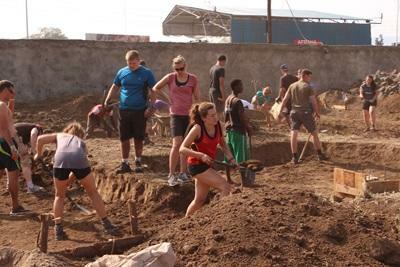 Working as a team we were able to dig and lay the foundations, create the playing surface, and erect the shelter. We were supervised by a small team of skilled locals to help construct the facility. It was strenuous work and an activity which was great for our bodies as was rooftop yoga at sunrise which helped us stretch off from all the digging we’d done the day before. The project was completed as far as was practical given the time frame we had of two weeks. Whilst the roofing was not able to be completed – all other aspects were completed and gratefully Projects Abroad agreed to hire locals to complete the roofing. The completed shelter was handed over to the Nakuru County Government on 25th July. It was satisfying to know our hard work had been finished and is being enjoyed by the local community. Some of our group furnished a local classroom, building chairs and tables as well as plastering the wall in a newly constructed IT classroom. Many locals, including the Minister for Sport and Education in Nakuru County, expressed their gratitude our work when they came and visited us during construction. Whilst working on the building project we also appeared in several Kenyan National Newspapers because of our work which was great! On the side of our building work we played several sports matches against local teams including football, volleyball, netball and sitting volleyball. We participated in a Tae Kwon Do session and a visit to the local swimming pool. We also enjoyed some local dances and a goat roast. These were both put on in gratitude for our work which was really kind of them. At the end of our building project we visited Nakuru Workers School due to their association with Nakuru Children’s Project. This experience was very humbling and emotional for the group. We drove to Lake Nakuru Safari which was an incredible place. We went around the entire lake with its amazing viewpoints. During the morning trip we saw rhinos, buffalos, giraffes, zebras, dik-dik, impalas, flamingos and an array of other exciting wildlife. We visited the Lake Nakura’s waterfall which was beautiful and very picturesque. 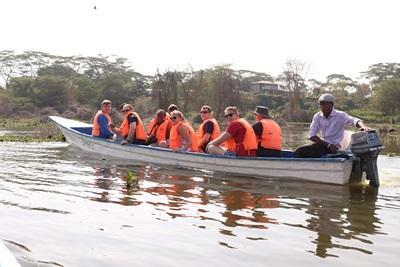 On the Sunday we travelled to Lake Naivasha and went on a boat safari around the lake. We saw more of Kenya’s wildlife including lots of birdlife, more giraffes, waterbuck and hippos. After the boat trip we swam in the lake which was really refreshing and fun. After Lake Naivasha we travelled to Hells Gate national park and walked the gorge. We saw ‘Devils Bedroom’ and showered in the hot springs which was perfect after a hard week of building and I felt ready and revitalised for more construction work after a weekend of enjoyable adventure and relaxation. When we landed back in the UK it was good to be home, but also sad that we had left Kenya. I miss the Kenyan people that we met and made such great friends with. Especially my close friend Sam who was unbelievably kind when he offered me as a gift his chess set which he told me he had owned since he was young. It was a special moment and I was so grateful that he gave it to me. We played a few games together before we left Kenya and every time he beat me! I look back with great satisfaction and pride with what our DSTU was able to achieve during the two weeks in Nakuru, making a real impact to the local community that we lived in for those two weeks. I had an amazing time in what is an amazing country and I am grateful for the organisation of the programme by Projects Abroad and the MOD for giving us the opportunity to go. I feel that it really developed our teamwork skills as a group as well as my own personal skills. It was the experience of a lifetime.